This showstopping sweater is such a stunning choice for your next girls night out celebration! The dazzling bright fuchsia color is sure to stand out from the crowd - it's such a bold choice for any event! This gorgeous off-the-shoulder top is so perfect for a fun summer afternoon! We love the fun smocked detail - it's such a delicate look! The light mauve color adds such a pop of style to this look! The lightweight material is so beautifully breezy, too! Summer break is right around the corner and this graphic tee is PERFECT for a fun day on the lake! Pair this awesome graphic tee with some ripped denim shorts and sandals for an easy & stylish lake bum look! 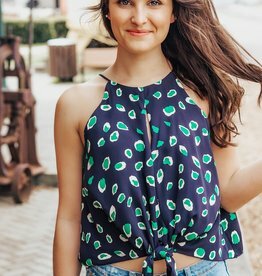 This gorgeous tank is so perfect for a fun summer afternoon! We love the fun print - it's such a delicate look! The peplum and tie front detail adds such a pop of style to this look! The lightweight material is so beautifully breezy, too! This unique animal print pullover is so wonderfully cuddly! Featuring a dazzling bright coral animal print paired with a unique open back detail, you're sure to love wearing this gorgeous style all day long! This darling mustard striped tank is such a must-have for your next girls night out! You can't go wrong with the classic striped detail! This cropped blouse looks so amazing with a printed skirt or high waisted pants! Ever have a tank that you are so Deep In Love with?! This one is THE ONE! You'll be the most fierce Babe at the beach this season. You will want to wear this tank all season long! Here's the top to slay all shoes! This emerald green blouse is a serious Crowd Pleaser with the gorgeous color. So chic that you'll want to wear this with every Spring outfit this season! And we won't blame you if you do Babes!